The former attorney general under President George W. Bush is voicing doubt about whether President Trump has the authority to appoint Matthew Whitaker as acting attorney general, saying there are "legitimate questions" about whether the selection can stand without Senate confirmation. In an interview with NPR, Alberto Gonzales, who served as attorney general from 2005 to 2007, also said that critical comments made by Whitaker about Robert Mueller's investigation into Russian interference in the 2016 election "calls into question his impartiality." Gonzales's comments add to a chorus of criticism that has faced the Whitaker appointment since Jeff Sessions announced on Wednesday that he was resigning as attorney general at the request of the president. In selecting Whitaker, who served as chief of staff to Sessions, the president passed over the official who had been in charge of the Mueller probe, Deputy Attorney General Rod Rosenstein. "I've got some issues with this, quite frankly, because the notion that the chief of staff who is not Senate confirmed would have more experience, more wisdom and better judgement than someone like the deputy attorney general or even the solicitor general, people in the line of presidential succession within the Department of Justice, to me, it confounds me," Gonzales said in an interview Saturday with NPR's Michel Martin. Those concerns stem from comments made by Whitaker before he joined the Justice Department last year. In an op-ed for CNN, Whitaker argued that the Mueller investigation had gone too far. He also told the network that he could envision a scenario where Sessions is replaced with an attorney general who "reduces [Mueller's] budget so low that his investigation grinds to almost a halt." In a separate interview last year with the Wilkow Majority on SiriusXM radio, Whitaker opined on the Mueller investigation, saying, "The truth is there was no collusion with the Russians and the Trump campaign ... There was interference by the Russians into the election, but that is not the collusion with the campaign." Addressing Whitaker's past statements, Gonzales said he questioned "whether or not putting Mr. Whitaker in this position at this particular time was the wise move." 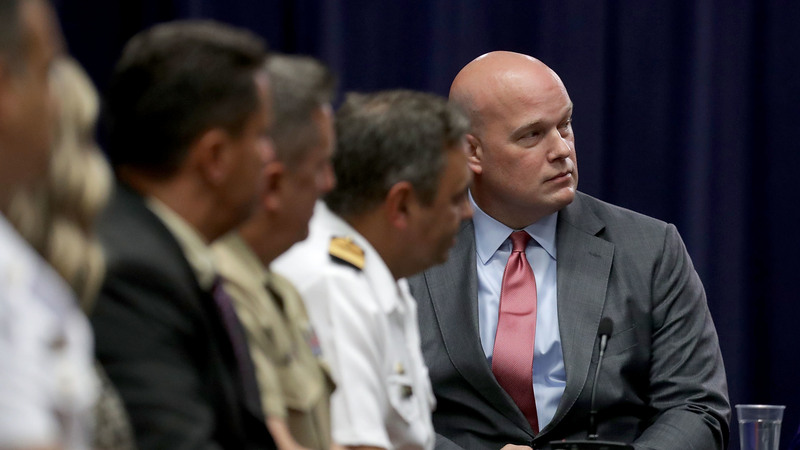 Even if the appointment is lawful, Gonzales said, Whitaker's comments raised "a whole specter of whether or not he should recuse himself, so again, we're right back in the situation where you've got the leadership at the department subject to questioning as to whether or not they can effectively lead the department with respect to one of the most politically charged investigations that's ongoing right now." On Friday, President Trump responded to criticism that he appointed Whitaker in order to rein in the investigation, saying he has not spoken to him about the probe. The president also said, "I don't know Matt Whitaker," even though he has met with him more than a dozen times. In October, President Trump also told Fox News, "Matt Whitaker's a great guy. I mean, I know Matt Whitaker." Adding to the concerns of Democrats is Whitaker's ties to a witness in the Mueller investigation: Sam Clovis. In 2014, Whitaker chaired Clovis's campaign for Iowa state treasurer. Clovis went on to work as an adviser to the Trump campaign, and is believed to be one of the campaign officials who spoke with another aide, George Papadopoulos, about overtures Papadopoulos was getting from Russians in London. The Washington Post, citing "two people close to Whitaker," reported on Thursday that the new acting attorney general has no intention to recuse himself from the Russia investigation. In a statement on Wednesday, Whitaker said he is "committed to leading a fair Department with the highest ethical standards, that upholds the rule of law, and seeks justice for all Americans." ... When the special counsel's office wants to issue a subpoena or send investigators or call witnesses before a grand jury, the deputy attorney general is often involved. If the new leadership at the Justice Department didn't want to go along, however, that could constrain Mueller's ability to investigate as he sees fit. And, if nothing else, having an attorney general who isn't recused from Mueller's work might give the White House a clearer look inside it. "The [Justice] Department may simply assert privilege based on law enforcement privilege to protect the integrity of the investigation and to encourage honest dialogue between investigators and prosecutors. Whether or not that privilege would be upheld in the court remains to be seen," he said. But Gonzales said it shouldn't have to come to that. "I'm extremely troubled that a change may have been made here to stop an investigation, which by all accounts is almost complete," he said. "I think we just wait and let this thing play out, let Bob Mueller write his report and let the American people know what actually happened here."